I finally decided to revamp one of our framed pictures at home. It was year 2007 when I made the layout with only but few tools and materials. As months and years passes by I get to acquire lots of items and was indeed opened to the real world of paper crafting. Looking at my past layouts, I am itchy to revamp most of it and so I started with our simple wedding picture taken 2002 of September. What made me decide to do revamping? It's been ages since I did a traditional scrapbook layouts and I really have to spend time on this matter coz scrapbooking is how I started into crafting. The Angel with an arrow is a cut I did using Love Struck Solution cartridge. 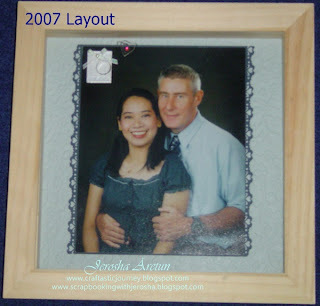 The sentiment "Always and Forever" is a cut using Sentimental Cricut cartridge. 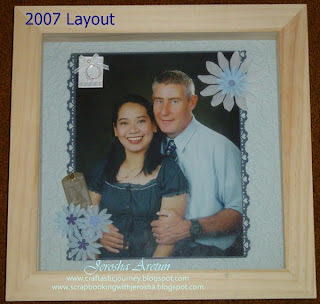 One of the things I will do starting 2012 is scrapbook traditional layouts and will revamp a lot of projects .... just thinking about it medyo I'm drowning na hehehehehehehe. Thanks for dropping by here.